To fulfill its mission to “continually improve the Port of Rotterdam and to make it the safest, most efficient and most sustainable port in the world“, Rijkswaterstaat, part of the Ministry of Infrastructure and Environment, decided in 2014 to improve the quality and reliability of the ocean current forecasting. The forecasting is based on a hydrodynamic model operated by Rijkswaterstaat. A transition is currently being prepared, in which the operational 2D model will be replaced by a new fully 3D model, created together with Deltares consultants. Rijkswaterstaat has chosen HF radar technology as additional real-time data input. The shore-based HF radar system provides reliable data of ocean surface currents as well as wave height and wave direction over long distances (in this case more than 60km offshore) with outstanding spatial and temporal resolution for vessel traffic service, search-and-rescue and environmental protection applications. 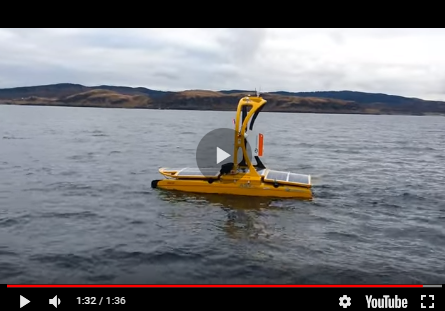 Due to the fact that there are no in-water system components, this technology offers a very good price-to-performance ratio compared to other ocean sensing instruments. It is easy to install and maintain. In contrast to single-point measurements, e. g. using buoys, an HF ocean radar system gives access to spatial data with the comfort of land-based instruments. The Port of Rotterdam in the Netherlands is Europe’s largest seaport and the sixth biggest port in the world. With its outstanding accessibility, it connects around 30,000 sea-going vessels with more than 100,000 inland vessels annually. To maintain and sustain the huge amount of nearly half a billion tons cargo per year to and from Central and Northern European fairways, ship traffic has to be safe and efficient. Using modern patrol boats and a high-tech traffic control system, the Harbour Division supervises shipping traffic day and night. As an official emergency service, the Harbour Master's Division, together with different aid agencies, is in charge of safeguarding coordination, safety of shipping traffic, and monitoring of surrounding areas. The EU tender ‘HF-Radar system Maasmond’ has been awarded to the German company HELZEL Messtechnik GmbH supported by the Dutch partner companies OCN and Radac. The ocean radar system WERA® manufactured by HELZEL delivers high-quality ocean current maps covering hundreds of kilometres offshore and maps of significant wave height within 50% and directional wave spectra within 30% of the current mapping coverage. The high-resolution current maps even show sub-mesoscale surface current structures. Various comparisons between surface currents measured by WERA® systems and sub-surface currents measured by acoustic Doppler profilers as well as drifters have shown a correlation of better than 0.9. A combination of the real-time WERA® measurements with numerical ocean models offer promising opportunities to improve the accuracy of oil spill drift prediction as well as improving search-and-rescue operations. A pair of WERA® ocean radar stations has been monitoring the surface currents (speed and direction) at the entrance of the Port of Rotterdam at Hoek van Holland since October 2015. This installation is the first permanent one in the Netherlands. First temporary experiments were already carried out in 1988 and 1996. Each station consists of one transmit antenna system using less than 30 Watts of transmitted power, 12 receive antenna elements (Figure 1), and the necessary electronic equipment. The operating frequency is 16MHz providing a range of up to 60km. The radar signals from the transmit antennas are backscattered by the ocean surface and then measured by the receive antennas. These HF radar systems use linear antenna arrays and apply beam-forming techniques to derive current data with highest spatial accuracy of typically ± 1° and high temporal resolution of up to 5 minutes. Four measurement cycles within one hour are combined from both radar stations in order to produce current vector maps (Figure 2 and 3). The coverage area extends beyond Hoek van Holland to the west and northwest directions occupying an overall area of 60 x 40km². The range resolution depends on the allocated radio bandwidth, in this case a grid cell size of 1 x 1km² is used. In the near future, the measurements will be assimilated into the envisaged new 3D ocean current model to improve marine oceanographic prediction. The radar system also provides met-ocean data for parts of the fairway at Hoek van Holland. This information will be available to the pilots and navigation officers of incoming and outgoing vessels as well as to the general public via websites. Deep draught ships, sailing through the narrow dredged shipping lane consisting of the Euro and Maas channel towards the Port of Rotterdam get the precise ocean current information in time to navigate safely towards their destination. The radar systems will become an integrated part of an improved hydrodynamic operational forecasting system which is currently under development for navigation to the port. The operational forecasting requires the highest availability and accuracy of the radar data. Furthermore, there is a strong focus on the online quality control procedures. For two defined areas, the requested data availability is 90% and 95%. The acquired current data from the WERA® radar system are presently compared with other data sources and model results. The analysis shows the level of current complexity in the estuary and how much of that can be observed on the surface. Figure 4 shows a satellite result versus HF radar. The satellite shows the murky outflow of the river at low tide. There is a distinct boundary line in the satellite picture just north of the inlet, which is the edge of the plume of river water. At this boundary the HF radar clearly shows the change in flow direction. Inside the plume the flow is offshore and just north of it the usual along shore flow is being blocked and diverted due to this river outflow. Scientific publications with results are expected for presentations during upcoming conferences and workshops. The reported data availability for current vectors has been more than 98% since October 2015. This reliability is not just based on the high quality standard of the radar, but is also a result of the excellent cooperation with the local partner companies OCN and Radac who take care of preventive maintenance by keeping contact with the data users and with third parties involved. Mal Heron, 2016. HF Radar for Port Management: Case study in the Port of Rotterdam. IEEE Proceedings, IEEE Oceans Shanghai.